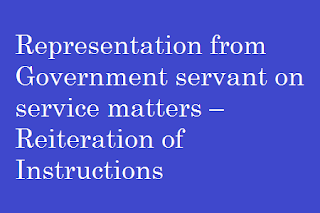 Representation from Government servant on service matters – reiteration of instructions – regarding. 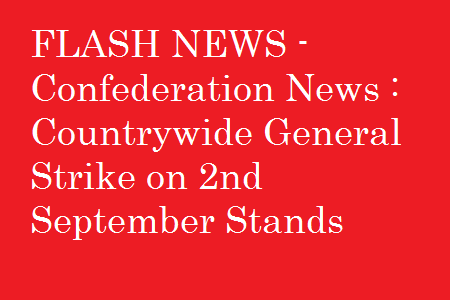 To put the facts straight, the joint platform of central trade unions have been pursuing with successive governments at the centre with their basic demands since 2009 and observed three rounds of countrywide general strike since 2010, the last being for two days in February 2013. In the two rounds of meeting between the CTUOs and the Group of Minister, nothing transpired in concrete terms except vague statements by the ministers on steps to be taken or being taken on some of the issues, that too not in the justify direction. The steps taken by the Govt on Labour Law amendments, are meticulously designed to throw out more than 70% of the workers on industries and other establishments from the purview and coverage of almost all basic labour laws and also to eliminate almost all components/provisions of justifys and protections of the workers. This was supplemented by more aggressive steps already taken by a good number of state governments to already amend the labour laws in the similar lines. On this issue, the Govt stated only that they will hold tripartite consultation before taking such steps. The trade unions demanded scrapping of such proposals by the central govt and also not to give assents (through President) to the unilateral amendments made by the state governments. Even in all the tripartite consultations held on some of the proposals of the Govt, the trade unions’ unanimous suggestions has been ignored by the Govt in favour of loud supportive applauds of the employers. Once these retrograde changes in labour laws totally dismantling the justifys and protection measures for the workers and also throwing more that 70% of the workers out of the purview of labour laws are enacted, thereby rendering the almost entire working people a justify-less entity in their workplace, what would ensure even payment of minimum wage and other social security benefits for them, even if those provisions are improved ? Can any trade union, worth its name accept such a machination designed to impose conditions of virtual slavery on the working people ? Despite repeated insistence by all the trade unions, the Govt refused to concede to the demand for recognizing the Scheme workers, viz., Anganwadi, Mid-day meal, ASHA, Para-teachers and others as “worker” with attendant justifys of statutory minimum wages and other benefits in gross violation of the unanimous recommendation of the 45th Indian Labour Conference in 2013, reiterated again by the 46th ILC in 2015. These workers and all the schemes have been put to further crisis threatening their existance owing to drastic cut in budgetary allocations for those schemes. In such a situation, does the assurance of the Govt to “extend social security measures” and “working out ways” for the same carry any meaning? Sub: Admissibility of Daily Allowance to Staff Car Drivers. 2. This would be applicable to all Drivers irrespective of the type of vehicle they drive. 3. These orders will t e effect from the date of issue. Past cases, will, however, continue to be dealt with under provisions of letter No.F(E)I/2006/AL-28/15 dt. 12.03.08. 5. ReceiRt of the letter may be acknowledged. 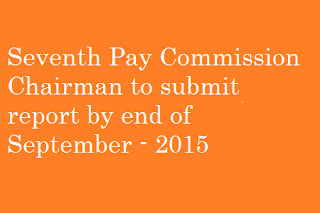 The Seventh Pay Commission set up by the government to revise remuneration of about 48 lakh central government employees and 55 lakh pensioners will submit its report next month, said its chairman Justice A K Mathur. The Union Cabinet, according to sources, is expected to extend the term of the Commission by two months until 31 October at its meeting on Wednesday. 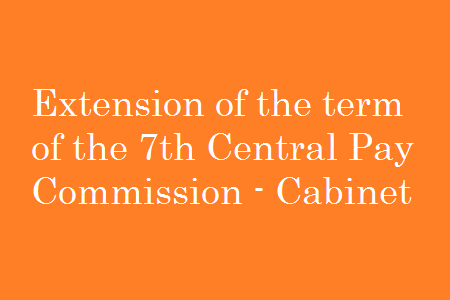 The term of the Commission ends this month. “The Commission will submit its report by the end of September,” Justice Mathur told PTI. The Commission, which was set up by the UPA government in February 2014 to revise remuneration of central government employees, defence personnel and pensioners, was required to submit its report by August-end. The Commission has already completed discussions with various stakeholders, including organisations, federations, groups representing civil employees as well as Defence services. It’s now in the process of finalising its recommendations. 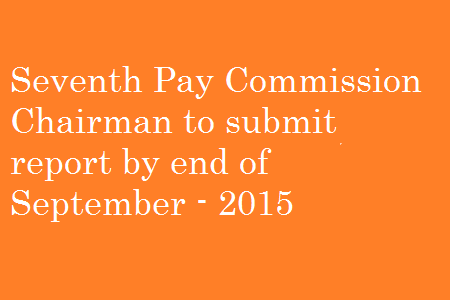 The recommendations of the Seventh Pay Commission are scheduled to come into effect from 1 January 2016. The other members of the Commission are Vivel Rae, Rathin Roy and its secretary Meena Agarwal. The Sixth Pay Commission was implemented with effect from 1 January 2006, the fifth from 1 January 1996 and the fourth from 1 January 1986. 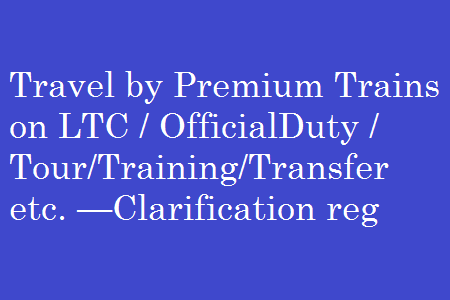 Travel by Premium Trains on LTC/Official Duty/Tour/Training/Transfer etc. —Clarification reg. 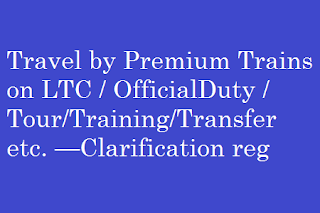 Sub: Travel by Premium Trains on LTC/Official Duty/Tour/Training/Transfer etc. —Clarification reg. 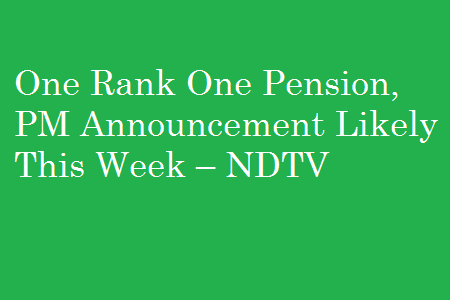 Prime Minister Narendra Modi is handling One Rank One Pension or OROP himself now and “positive movement” is expected on the issue this week, sources have told NDTV. One veteran on hunger strike, Col (retd) Pushpender Singh, was taken to hospital yesterday after he took ill. The veterans have repeatedly reminded PM Modi that OROP was one of his key promises in the run-up to the national election last year. OROP is expected to benefit more than three million retired servicemen. 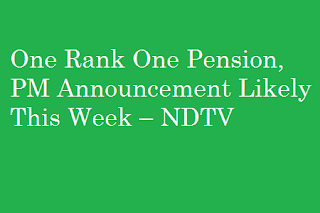 It will give equal pension to servicemen retiring at the same rank regardless of when they retire. At present, a soldier who retired many years ago is paid far less than someone several ranks junior to him retiring now. (7) Grant of Financial Up - gradation under MACPS to the staff who are in the same Grade Pay for more than 20 Years. 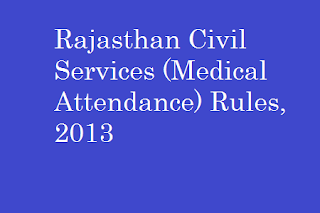 Health Benefit Empowered Committee (HBEC) constituted under Rule 4 of the Rajasthan Civil Services (Medical Attendance) Rules, 2013 in its meeting dated 04-06-2014 decided that empanelled hospitals shall be bound not to charge from State Govemment employees, more than the rates as fixed by the State Government. "Hospital shall be bound not to charge from the State Government employees and pensioners, more than the rates as may be fixed by the State Government from time to time for approved private hospitals for various inpatient and outpatient treatments, investigations and implants." 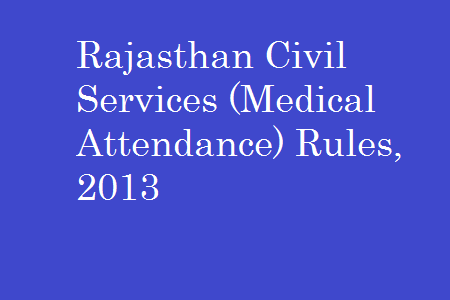 Accordingly, Finance Department issued order number F. 6(2) FD/Rules/2013 Pt-ll dated 27-06-2015 to adopt the rates of CGHS, Jaipur, as may be amended from time to time, as maximum chargeable rates. As Saket Hospital, Jaipur has now denied to provide treatment as per FD Order dated 27-06-2015 (mentioned above), in violation Of the affidavit submitted by it, the State Government in exercise of the powers conferred under rule 4 Of the Rajasthan Civil Services (Medical Attendance) Rules, 2013 hereby terminates the empanelment of Saket Hospital, Jaipur as an approved hospital in the rules with immediate effect, Appendix-I to these rules is amended accordingly. 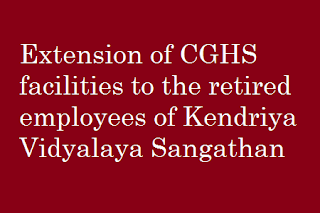 Extension of CGHS facilities to the retired employees of Kendriya Vidyalaya Sangathan – regarding. Subject: Extension of CGHS facilities to the retired employees of Kendriya Vidyalaya Sangathan – regarding. a. CGHS facilities shall be extended to the retired employees of KVS only in Delhi/NCR. They will be entitled to OPD facilities and medicines from CGHS dispensaries in Delhi/NCR only on the same lines as is being done in case of serving employees of KVS. b. They may avail treatment from CGHS empanelled hospitals at CGHS approved rates. The medical expenses for IPD/hospitalization treatment will be borne by KVS and they will not be eligible for cashless medical facilities. c. The pensioner’s card will be issued to those pensioners who have been recommended by KVS and on payment of service charges on cost to cost basis in advance on yearly basis at the rates determined by Department of Health and Family Welfare in consultation with O/o the Chief Advisor (Cost), Department of Expenditure, Ministry of Finance. 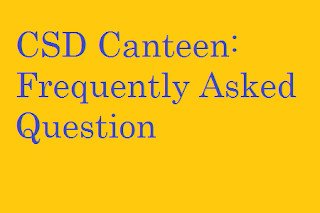 d. The CGHS membership card will have to be renewed annually by KVS in advance for both serving as well as retired employees (wherever applicable). Failure to renew the CGHS membership within the specified time period will lead to de-activation of the CGHS card. e. There is no provision for issue of life-time CGHS cards to the pensioner beneficiaries of KVS. *. The retired employees of KVS residing in Delhi/NCR and whose serving counter parts are covered by CGHS medical facilities in Delhi/NCR can opt for this scheme. The details of such posts covered by CGHS medical facilities are given in Annexure – I. *. The willing retired employee(s)/family members (if otherwise eligible) may submit their application in prescribed proforma (Available on CGHS website msotransparent.nic.in with link Circulars) along with Demand Draft of his/her own subscription, self attested copy of relevant documents to the respective authority from where the terminal benefits were settled (Pension Sanctioning Authority of KVS HQ/Deputy Commissioner, Regional office as the case may be applicable). *. The Deputy Commissioner of the Region concerned, after detailed cross verification and examining the case will forward such duly completed application(s) to the joint commissioner (pers.) KVS, Headquarters along with prescribed contribution in the form of Demand Draft/Cheque equivalent to one year CGHS subscription in favour of “Kendriya Vidyalaya Sangathan (HQ)”. *. In respect of officers/employees of KVS, HQ, such request applications will be processed by the Deputy Commissioner (Finance) who looks after the pension section and who will forward the same with all necessary documents to the joint commissioner (Pers. ), KVS. *. 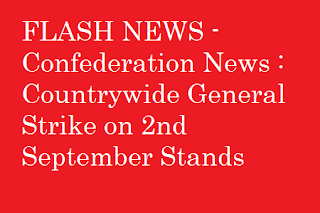 The payment of Fixed Medical Allowance will be discontinued by the concerned pension sanctioning authority in KVS/Regional Office from the date of receipt of CGHS card in K.V.S. on case to case basis, after due verification. *. The reimbursement of medical claims of beneficiaries, if any, will be done by respective Regional Office as per rules. It will take effect from the date of issue. Honourable Finance Minister Shri.Arun Jaitely had spoken about the possible impact of 7th CPC recommendations in Parliament. The Speech is critically reviewed by Comrade Elangovan of DREU. 1. The Medium Term Expenditure Framework statement has not yet been uploaded in Finance Ministry’s website.However I have taken the figures provided by print media including The Hindu.As per their statement the expenditure on salaries will rise by 9.56% in the fiscal 2015-16 as a result of 7th CPC implementation over the normal estimated expenditure in the 2015-16 budget to Rs.100619 crores. This means that the expenditure projected was Rs.91,839cr which if increased by 9.56% becomes Rs.100619 crores. 3. As per the estimated strength and provision there of statement laid as part of finance budget,the normal projection as PAY was Rs.60731 cr and so DA is Rs 31,108 as deducted from Rs 91 839 cr. The budget document does not give the DA expenditure separately. It gives the total expenditure on all allowances. I have therefore arrived at the figure based on calculations. However I have sought the expenditure on DA, HRA, and Transport Allowance separately through RTI. 4. The increase proposed is Rs.100619 cr from Rs.91,839cr which means that there will be an increase of Rs.8780 cr. 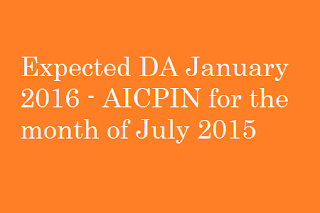 There won’t be any DA after 1-1-2016 up to 31-3-2016 in the fiscal 2015-16. Therefore the whole increase is on basic pay in this fiscal. 5. As we have already seen that the basic pay is Rs.60731 cr. the increase of Rs.8780 cr. is over this Rs.60731.This increase is 14.45% only.The expenditure projected for 2016-17 is Rs.1,12,000cr which is Rs.11,400 more over 2015-16 which works out to 11.32%. This is due to Increment, DA,HRA, TRA etc.The projection for 2017-18 is 1,16,000 cr. 6. If 40% of Basic Pay is to be given,the increase of expenditure in the fiscal 2015-16 must be Rs. 24000 cr as against the Rs. 8780 cr. The demand of JCM Staff side is that there must be an increase of 371% of basic pay as on 1-1-2016. With the 119% DA we would be drawing 219% already. 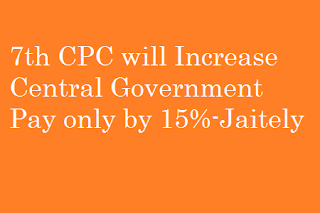 The real increase demanded is 152% of Basic Pay.So not the 152% or 40% of 5th and 6th CPC is intended to be given to us. 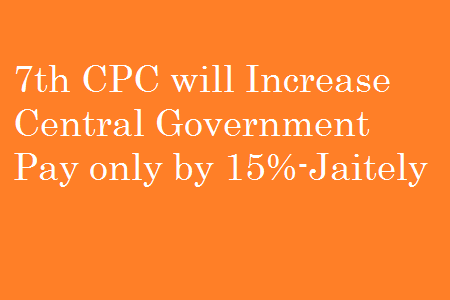 Only around 15% is going to be given.As The Terms Of Reference of 7TH CPC directs them to recommend only what is‘FEASIBLE AND DESIRABLE’ to the Government.Now the Government In Parliament states only 15% is FEASIBLE AND DESIRABLE. ARE WE TO ACCEPT IT.? Some PSUs got 15%. But that is for 5 years. But for Central Government Employees it is for Ten Years.Are We To Accept? ARREARS Rs 26084 cr. For three years mostly on Pay and DA regular PAY Increase per annum: Rs 8685 cr. These are actual figures. The 219% of Rs. 8685 cris Rs.19000 cr. EVEN THIS IS NOT GIVEN. 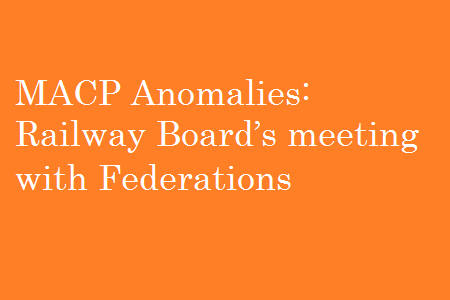 10.We must issue a warning to the government afresh demanding acceptance of our demand.I recall my earlier note where in I had quoted BibekDebroy’s report that the 7th CPC will not be that destabilising to the Government as that of 6th CPC. GOVERNMENT PROVES THAT. Office of the principal controller of factories has been envisaged to control the functioning of forty one branch AO under 9 Group controllers. The following PAO comes under purview of this office as being pr.PAO so far as NPS is concerned. The main aim/objective behind the creation in factory organization is to render efficient, correct, prompt accounting and payment services besides financial/expertise services to factory management and OFB Authorities. 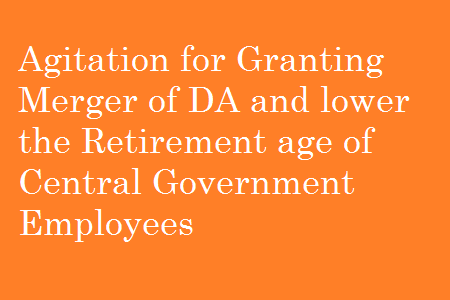 Government of India has introduced a New Pension Scheme replacing the defined benefit pension scheme. The New Pension Scheme comes into operation w.e.f from 01.01.2004 and applicabel to all new entrants of Central Government Service on or after 01.01.2004. The New Pension Scheme is working on defined contribution basis and will have two tiers-Tier-I and Tier-II. Tier-I is mandatory for all Govt. Servants/employees of autonomous institutes. In Tier-I government will have to make a contribution of 10% of the Basic pay, DP and DA which will be deducted from his salary bill every month. Government will make equal matching contribution and will deposit the same in non-withdrawal pension Tier-I account. Under NPS system Branch Accounts Offices are termed as “Pay Accounts Offices (PAO)”, As a Central Govt. Office, the correct and timely deposit of contribution in Tier-I account by the respective Branch Accounts Offices (PAOs) is the prime concern. As a part of PFRDA (Redressal of Subscriber Grievance) Regulation, 2015, every intermediary is required to follow the Grievance Redressal policy. 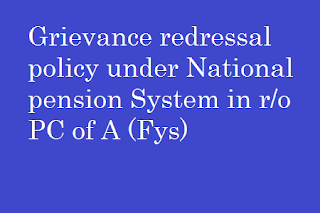 Accordingly, the below stated Grievance Redressal policy (GRP) is made for prompt redressal of the grievances arising out of various services offered by the Branch Accounts Offices in the capacity of intermediary. 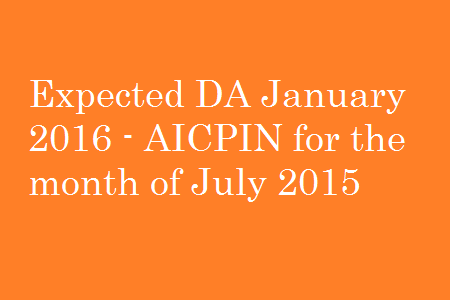 The scope of this GRP is restricted to redressal of grievances raised against intermediary. (iii) Communications seeking guidance or explanation. (v) complaints that are subjudice (cases which are under consideration by court of law or quasi-judicial body) except matters within the exclusive domain of the PFRDA under the provisions of the Act. The purpose of this policy is to set forth the policies and procedures to be followed in receiving, handling and responding to any grievance against the concerned PAOs in respect of the services offered by them. The following are broad objectives for handling the customer grievances. 1. To Provide fair and equal treatment to all employees of respective Factory/Branch Offices without bias at all times. 2. To ensure that all issues raised by employees are dealt with courtesy and resolved in stipulated timelines. 3. To develop an organizational framework to promptly address and resolve employees Grievances fairly and equitably. 4. To Provide enhanced level of satisfaction. 5. To provide easy accessibility to the employees of respective Factory/Branch offices for an immediate Grievance redressal. 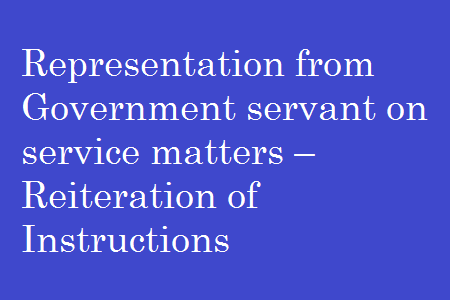 6.To put in place a monitoring mechanism to oversee the functioning of the Grievance Handling Policy. 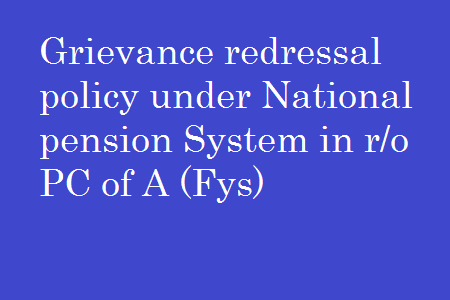 By raising a grievance in writing – in the specified format/letters/representation addressed to the Grievance Redressal Officer,PAO/Chief Grievance Redressal Officer, pr.AO. The grievance will be resolved by concerned PAO and then appropriate reply will be sent to the complainant by the PAO/Pr.AO. Every grievance has to be disposed – Off by the PAO within a period of thirty days of its receipt at both the redressal tiers. 10-A S.K.Bose Road, Kolkara – 700 001. Phone No. (033) 22484341 Fax No. (033) 22480991. 10-A S.K.Bose Road, Kolkata – 700 001. 4. Shri Rajesh Kumar, Sr A.O. Phone NO. (06112) 257105 Fax No. (06112) 257102. If the complainant is not satisfied with the refressal of his grievances or if it has not been resolved by Grievance Redressal Officer, concerned PAO by the end of thirty days of the filing of the complaint, he/she may escalate the grievance to the chief Grievance Redressal Officer (CGRO). The record of grievances will be maintained by the concerned Redressal Officer. A8. AFD Items like Refrigerator, TV, Washing Machine etc can be purchased after every three years by all categories. A9. Entry into any URC will be purely Smart Card based by personal appearance. In case a particular Offr/JCO/OR/Equivalent is unable to present himself personally due to valid reasons like old age or acute medical problem, a permission, signed by the Chairman/ CO/OC of the unit/ establishment running the URC must accompany the Smart Card with photo of the authorized person carrying it. Validity period and genuineness of requirement of such permission will be decided by the Chairman of the URC on case to case basis. 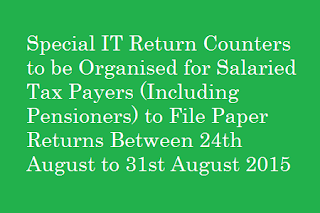 The special counters are being organized to facilitate smaller tax payers having salary/pension income, to file paper returns. Taxpayers may note that for the assessment year 2015-16, corresponding to the financial year 2014-15, e-filing of return of income is mandatory for persons whose total income exceeds Rs. 5 lakhs or if the return contains a claim for refund. Paper Returns in such cases will not be accepted. However, the income limit of Rs. 5 lakhs and claim of refund will not apply to taxpayer over the age of 80 years deriving salary/pension income. In such cases paper returns will be accepted. 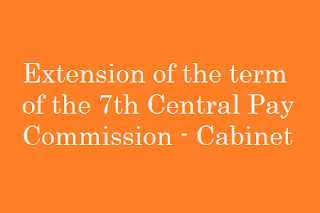 · For PCIT-22 Charge (Government salary)-‘B’ Block, Ground floor of Civic Centre, Minto Road, New Delhi. 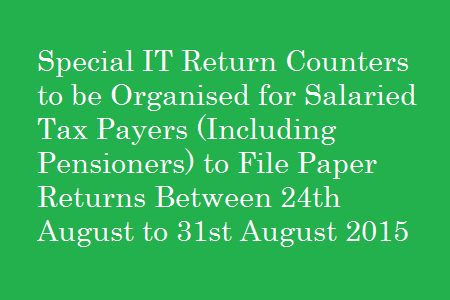 · For PCIT-23 Charge(PSUs/Bank employees/School and College employees)-‘C’ Block, Ground floor, Civic Centre, Minto Road, New Delhi. · For PCIT-24 Charge (Private salaries)- ‘C’ block, Civic Centre, Minto Road, New Delhi. There will be special facilitation counters for senior citizens and differently abled persons. Facilities like a Helpdesk, assistance of Tax Return Preparers (TRPs), UTI/NSDL counters, banking, tax payment facility, PAN verification counters, drinking water, and emergency medical aid will be available at the venue. Similar facilitation counters are being set-up in other metropolitan cities based on the local requirement. 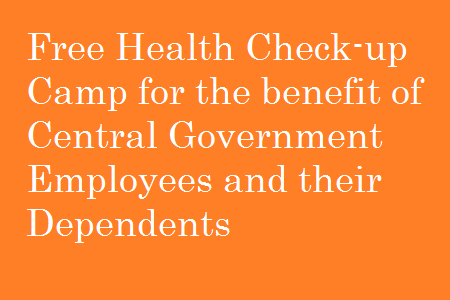 Subject: Free Health Check-up Camp for the benefit of Central Government Employees and their dependents at Samaj Sadan, Grih Kalyan Kendra, Peshwa Road, New Delhi on 22nd August, 2015 (10.00 AM to 2.00 PM). 1. Health Check-Up Rockland Hospital, New Delhi. BMD, PAP Smear & ECG. 2. 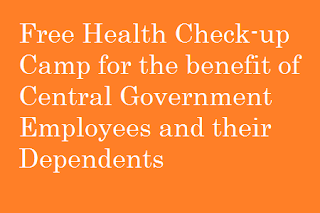 All are requested to avail the facility of free Health Check-up and Eye Check-up Camps. 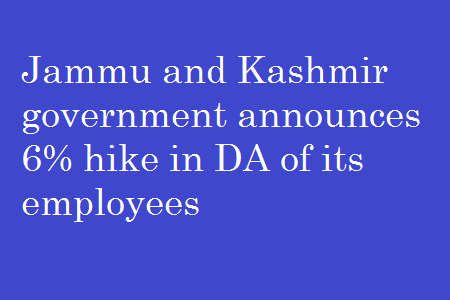 Srinagar: Jammu and Kashmir government today announced a six per cent hike in the Dearness Allowance (DA) of its employees with effect from January this year. The decision was taken at a cabinet meeting chaired by Chief Minister Mufti Mohammad Sayeed here. 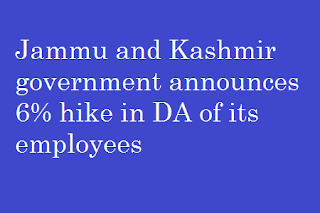 “This is in fact for the first time that the government employees are getting DA without resorting to agitation,” Akhtar, who was also flanked by Finance Minister Haseeb Drabu, said. He said it was a practice here that the DA was not released till there was an agitation. “Today as part of its duty, the government had taken a decision, which also belies the rumours about money not coming (from centre) and also gives out a message that the system is getting streamlined in the state,” he said. Drabu said the idea behind the decision was to keep pace with the centre announcing DA for its employees. “We have announced DA from January 15 to July 15 (and will be paid to the employees) through Provident Fund route, post that it will in cash, thereby we are moving to a system whereby the nearest amount will be given in cash,” he said. He said the large part will be in cash. “In respect of employees who are at the new pension scheme, the installments will be in cash. Financial implications is about Rs 285 crores for the year. Of that Rs 240 crore is salary and the rest is pension. We have made provision for that in the Budget. “The idea is to build system. In the last three-four months, we have got a lot of liabilities at various levels and we are trying to work out a system wherein there will be a transparency and finance will not be a constraint for development activities,” the finance minister said. 2. 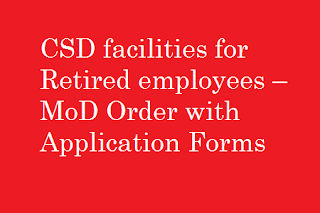 Government of India has decided to extend the CSD Canteen facilities to the Retired Defence Civilian Employees vide MoD letter No. 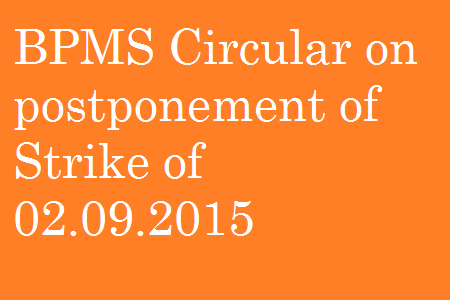 F.No.8(14)/2015-D(Mov) dated 31 Jul 2015. (a) Ministry of Defence including those working in their respective attached offices and those working in lower military formations. (e) Indian Defence Accounts Services. (f) Secretariat Border Roads Development Board and HQ Director General Border Roads. 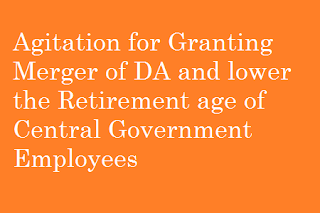 (g) Retired employees of Canteen Stores Departments who are getting pension from CSD Fund. 4. Entitlement : They will be entitled for only Grocery Stores. No Liquor will be authorised. 5. Validity : The cards will have a validity of 10 years, from the date of issue and will be renewed every year. 6. Process for applying for Retired Defence Civilian Employees Card : All Retired Defence Civilian Employees will apply for the Smart Card to the URC through which they want to avail the Canteen facilities after authentication of the application. 7. Authentication : The application form will be authenticated for its correctness by the Department from which the employees has retired. The form will be countersigned by an officer not below the Rank of Under Secretary or equivalent. 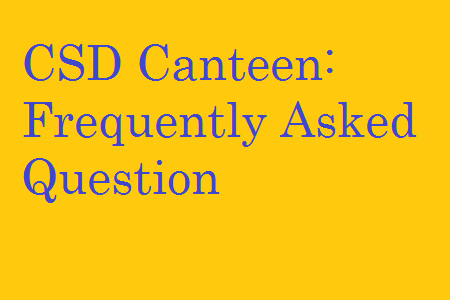 (a) Application for Canteen Smart card duly countersigned by the competent authority. (b) Govt order for Retirement. (d) Address Proof and Copy of PAN card. (e) Payment of Rs.135 to the URC. (a) Each concerned department should appoint officer authorised to countersigned and promulgate orders and forward details to this office. (b) Countersigned officer will verify that all columns are filled correctly prior to countersigned. (a) That application is filled in all respect and no column is left blank. (b) Signature of Countersinging authority. 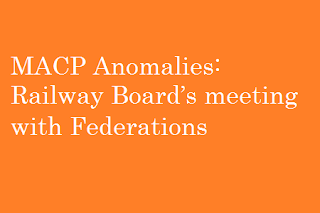 (c) All personal particulars are checked for correctness with PPO and other supporting documents. (d) In case an application is rejected the same will be informed to the applicant. (e) New card will be sent by M/s. Smart Chip Ltd to the URC for issue to applicant. URC will check details with individuals Departmental retired identity Card prior to issue of new Canteen Smart Card. (f) Since large number of applications are likely to be received initially at the URCs, the URC Manager must exercise due diligence while scrutinising and verifying the applications. (a) All applications are sent by CCTS to M/s. Smart Chip Ltd, at the earliest. (b) On receipt of application check for correctness with existing records through old Grocery Card Number. (d) Ensure previous card of applicatin is hotlised prior to handing over of new card for Retired Defence Civilian Employees. 12. 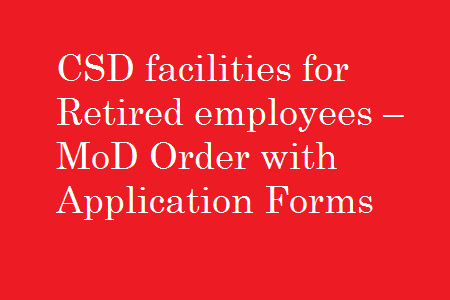 The application form (Blue Color) for Retired Defence Civilian Employees attached as Appendix will be made available in the URCs at the earliest by M/s. Smart Chip Ltd.
13. This letter be given vide publicity by displaying at prominent places like URSs, Station HQs, CAO and other controlling HQs.